Tourism to the Niagara USA destination is on the rise. The Niagara Tourism and Convention Corporation (NTCC) released the destination's first-ever economic impact report on March 30. 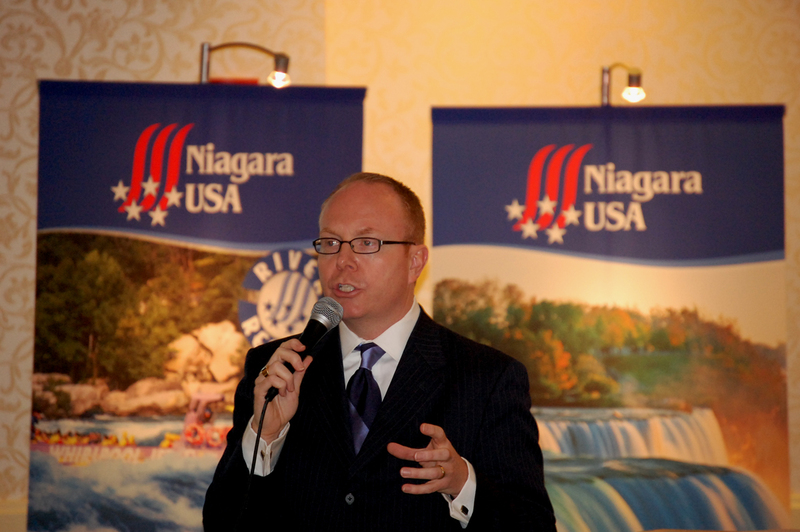 NTCC President & CEO John Percy estimates that 4.5 million visitors spent more than $400 million in Niagara USA in 2005 alone. Everyone in our region--not to mention the Falls themselves--plays a significant role in attracting visitors to our destination. But we are proud of the increases we've seen in tourism revenues and we are optimistic about future growth. More than 4.5 million travelers spent approximately $400 million in Niagara County in 2005, the Niagara Tourism and Convention Corporation (NTCC) announced today. Overall, the amount of revenue added to the local economy because of tourism likely exceeded $600 million in 2005. NTCC President & CEO John Percy said that two independent analysis--one conducted by Oxford Economics and one conducted by the organization's strategic communications firm--came to similar conclusions regarding visitation trends and spending. The data is augmented by information from the State of New York and Smith Travel Research. In 2005, travelers spent between $386 million and $401 million in Niagara County. Spending estimates include lodging expenditures, food and beverage, retail and transportation. Hotel revenues, which account for between 14 and 19 percent of overall spending, increased 7.4 percent from 2004 to 2005, according to Smith Travel Research reports. Tourism spending increased by 23.8 percent from 1991-2005, according to the New York State Department of Taxation and Finance. There were 4.5 million overall visitors to Niagara USA in 2006, with 1.5 million visitors staying overnight in Niagara USA. Percy stressed that these were highly conservative estimates, and that the number is likely higher. NTCC is relying on lower estimates because of the difficulty of counting day-travelers to a border destination. "Of course, the NTCC cannot take credit for all tourism to Niagara USA," Percy said. "Everyone in our region--not to mention the Falls themselves--plays a significant role in attracting visitors to our destination. But we are proud of the increases we've seen in tourism revenues and we are optimistic about future growth." When it comes to employment, Oxford Economics estimates that 7,917 jobs in Niagara County are directly related to tourism, generating $221 million in tourism income. Of all counties in the five-county Niagara region (Erie, Genessee, Niagara, Orleans and Wyoming), Niagara County depends most on tourism for jobs. Nine percent of all jobs in Niagara County are related to tourism. Niagara County tourism also contributes to the local and state tax base. According to Oxford Economics, Niagara County tourism generated $25,869,383 in local taxes and $19,917,371 in state taxes in 2005. Percy presented the research at the organization's Stakeholder's Report Meeting on Friday, March 30. Percy also unveiled NTCC's aggressive marketing plan for 2007, which calls for enhancements to Visitor Centers, increased outreach to the convention and group tour markets, a comprehensive advertising campaign to attract travelers from several targeted geographic areas and a media relations effort. •Tourism Economics, a Division of Oxford Economics. The Economic Impact of Travel & Tourism in New York State and Each of its Regions and Counties. September 2006. •Tourism Economics, a Division of Oxford Economics. The Economic Impact of Travel and Tourism in New York State and the Economic Impact of the I Love New York Campaign. September 2006. •Smith Travel Research. 3-year report on hotel revenues. February 2007. •State of New York. Travel Spending and Taxes. March 2007. •Campanella Communications Group, LLC. Niagara USA Economic Impact Analysis 2007. February 2007. NTCC President & CEO John PercyNTCC President & CEO John Percy presents economic impact data to tourism stakeholders in Niagara Falls, New York on March 30, 2007.